The C3 Picasso MPV majored on quirky style, making what could otherwise be a forgettable shape quite fun and interesting. Citroen's Picasso compact MPV was a huge sales hit so the French company used the name again, this time on a smaller vehicle based on the Citroen C3's platform. The unambiguously titled C3 Picasso was the result, going on sale in 2009. The C3 Picasso majored on quirky style, making what could otherwise be a forgettable shape quite fun and interesting. Citroen Ireland quietly dropped it from the line-up in 2015. The C3 Picasso competes in the growing mini-MPV marketplace, being a tall, compact, but space efficient shape, with a heavy emphasis on practicality. There was scope for personalisation over the familiar VTR, VTR+ or Exclusive trims, but it never attracted quite the sales it could have here despite this, though savvy used buyers might find the C3 Picasso to their liking. The engine range followed the norm for a car of this size and class, with 1.4- and 1.6-litre petrol options, and a pair of 1.6-litre HDi turbodiesels. The latter would be the most common choice, their outputs typical for the segment too, rated at either 90- or 110hp - both fitted with a five-speed manual gearbox. For such a practical, family focused vehicle, Citroen did rather scrimp on interior stowage, while the smartest equipment - like seat back tables and rear sun blinds - were reserved for the range topping Exclusive models. Otherwise the interior is decently built, if not to Volkswagen standards. Citroen’s quirkiness is evident via the large, sometimes tricky to read digital instruments that are positioned top and centre of the dashboard. It might look fun, but it’s not that engaging to drive, but the likelihood is you’ll have kids in it so you’ll be distracted enough. They’ll thank you for the smooth and comfortable suspension, though if you want the easiest progress then the 110hp diesel engine is the one to choose. If you’re intent on taking it on the school run then that 90hp HDi will suffice, though if your commute’s a bit longer then dig deeper for a 110hp HDi. Trim levels are all reasonably well equipped, though Exclusive does add some useful items like rear window blinds. 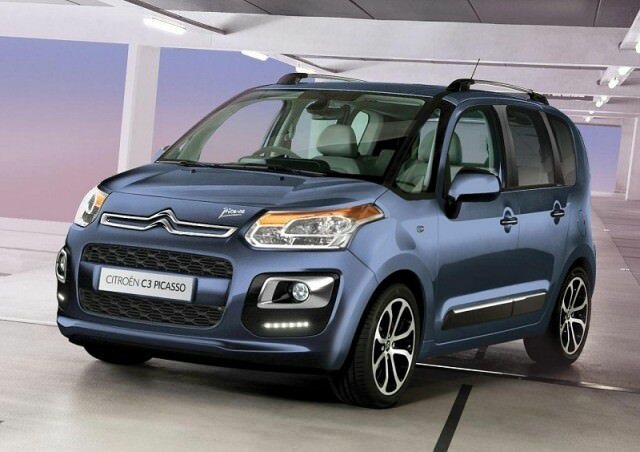 Revisiting the C3 Picasso genuinely has us wondering why it didn’t do better in Ireland. A compact but spacious family car, with sensible running costs and stand-out looks it should, and could, have sold better. That’s arguably to the benefit of used buyers, who might be able to get a bargain due to the C3 Picasso being off most buyers' radar. Keep it quiet, then, but the C3 Picasso’s quite good.